Major League Lacrosse action continued fast and furious after an incredible All-Star Game, repercussions of the New York and Boston trade and Team USA tryouts. The All-Star game had many selectees unable to attend as they prepared for Team USA tryouts, but that did not stop an incredible game that ended on a Myles Jones game winner. Players took the old adage of token defense in all-star games threw it out the window in this game as many of them displayed their athleticism and toughness. As the action settled, Denver again finds itself on the top of the standings after defeating Ohio. Florida held off a Chesapeake comeback to honour Casey Powell’s jersey retirement and move into third place. Charlotte, Atlanta, Rochester and New York finished the week tied at 5-6 with playoff hopes intact. Chesapeake dropped to 4-6 while Boston fell to 3-7 on the season after learning neither player they acquired via trade with New York will dress for them. The league finds itself in almost the same place as last season with almost every team still alive in the playoff hunt. New York started strong against Atlanta with Paul Rabil scoring a 2-point goal, but the Blaze hung with the Lizards. Rabil scored another 2-point goal at the end of the first giving the Lizards a 5-4 lead. The scoring by both teams remained close through the second as New York took a 9-7 lead into halftime. Atlanta narrowed the deficient and made it a one-goal game at the end of the third with New York in front 13-12. Atlanta went on a four goal run in the fourth quarter, taking the lead from New York. The Blaze held on for the win in spite of a crafty two-point attempt by New York as they attempted to utilize Kyle Hartzell’s long range shooting to tie the game. Kevin Rice, James Pannell, and Randy Staats all scored hat tricks for Atlanta as did Mark Mathews who won offensive player of the week honors. Rabil, of course, led the Lizards with two 2-pointers and another score followed by Rob Pannell with three goals. Will Manny continued to prove that New York got the best of the trade by chipping in two goals. New York got the best of the face off battle as Gurenlian and Garino went 20-32 against Atlanta. Adam Ghitelman made 15 saves for Atlanta while Drew Adams made 14 save despite having to shake off an apparent injury to return to the game. Next: Atlanta faces Chesapeake while New York takes on Boston. 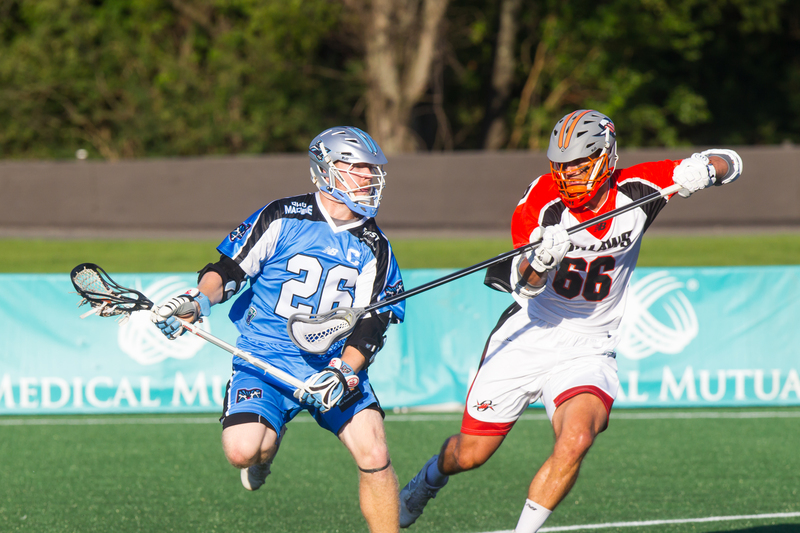 The next action of the weekend saw the Denver Outlaws defeated the Ohio Machine as the two teams who dominated the one and two spots met in Ohio. Ohio was without their offensive leader Marcus Holman for this game. Despite Holman’s absence, this proved another close and tightly contested battle as the Machine led 5-4 at the end of the first quarter. The score remained tight as Ohio took a 7-6 lead into halftime. The end of the third quarter saw both teams tied at 10-10. In a low scoring fourth quarter, the Outlaws outscored the Machine 3-1 to seal a 13-11 win Eric Law and Wes Berg each scored three goals to lead Denver in scoring and Mike Bocklet added two goals in the victory. Romar Denis scored on what may have been the most casual looking 2-point jump shot of the season, displaying his power and athleticism. Connor Cannizzaro and Mark Cockerton led Ohio with three goals each while Kevin Cunningham chipped in two goals. Denver took a 15-27 edge in the face off battle as Ohio has struggled all season at the X. Kyle Bernlohr made 14 saves for Ohio, but Jack Kelly made 22 as he secured the win. Next: Denver takes on Rochester in a Thursday tilt then turns around to face Ohio again during the weekend. Florida tangled with Chesapeake as they retired the living legend Casey Powell’s jersey at halftime and continued their turnaround season. Florida jumped the Bayhawks early and led 5-1 at halftime. Riding the emotion of the weekend, the Launch continued to pile on the points as they built an 11-3 halftime lead. Florida appeared primed to run away with the game, but the Bayhawks scored nine goals on the third quarter and narrowed the Launch’s lead to 15-12. The fourth quarter reflected the nature of MLL as both teams went on runs and this game saw the Launch outlast the Bayhawks. Florida continues finding ways to win games as the season winds down they now have a weekday and weekend slate of games they need to win for a shot at the playoffs. Kieran McArdle led Florida with four goals as Dylan Molloy, Nick Mariano, Chazz Woodson and Steven Brooks all scored hat tricks. Josh Byrne led Chesapeake with six goals and Matt Danowski chipped in four goals (one of them a 2-point goal). Colin Heacock and Lyle Thompson each scored two goals each. Chesapeake got the best of the face off battle going 22-40. Austin Kaut made 16 saves while Brian Phipps and Niko Amato combined for 12 saves. Next: Florida and Chesapeake face each other again. New York put all thoughts of being tired from Team USA tryouts aside as they downed the Charlotte Hounds. Both teams fought to a 3-3 tie at the end of the first quarter. New York scored five goals in the second and took an 8-4 lead at halftime. New York extended their lead in the third to 12-8, held the lead, and secured the 14-11 win. Rob Pannell led the Lizards with four goals and Will Manny, Greg Gurenlian, and Paul Rabil followed him with two goals each. Matt Rambo led the Hounds with three goals and Kevin Crowley scored two goals. New York won the face off battle 19-29 as Gurenlian went the distance for the Lizards. Drew Adams continues to be a brick wall as he made 17 saves while Charlie Cipriano made 12 saves. Next: Charlotte faces Florida in a weekend matchup after the Launch have a weekday meeting against the Bayhawks and New York faces Boston. Rochester dismantled the Boston Cannons as they jumped out to a 5-2 first quarter lead and extended their lead to 12-3 at halftime. The Rattlers piled on the points in the third as they led 18-4, but Boston managed to find some offense in the fourth quarter and score five goals. Jordan Wolf led the Rattlers with five goals and Jordan MacIntosh added four goals. Eric Fannell and Ryan McNamara scored hat tricks as the Rattlers rolled on offense. Kevin Buchanan and John Uppgren score two goals apiece to lead the Cannons. John Galloway split time with Blaze Riorden as both goalies combined for eight saves. The Cannons also split time in goal as Tyler Fiorito and Jack Murphy combined for 19 saves. Joel White earned defensive player of the week honours for his performance in the game. Next: Boston faces New York as the Cannons activate Luke Goldstock and Rochester takes on number one Denver.